During most of the novel I was wondering what the hell was going on and didn’t like it. But by the end I loved it. I wished Origin would have been a bit more clear, but maybe it was better this way. I give Origin by Dan Brown four out of five heart because during most of the novel I didn’t understand it but in the end my confusion turned into love. Because I finally started to understand. 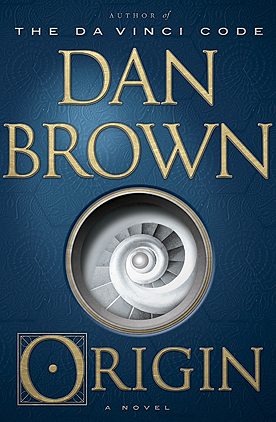 This time Dan Brown took Robert Langdon to Spain and Barcelona. It hasn’t been long since I have been to Barcelona myself and it made those pieces better because I recognized the places Dan Brown was mentioning. The novel basically starts and a friend of Robert Langdon gets killed, which immediately pushes the story into a fast river of things. This time Robert Langdon is much more active in choosing what he want to do to figure the murder out. The woman this time next to Roberts side is Ambra, the fiancé to the crown-prince of Spain. She was an okay sidekick, but I mostly liked her for her background. Because the rest just happened to her, making her very passive. The enemy of this novel is throughout the book not clear and only by the end it becomes clear on what is really going on. This was the point where I finally started to see what was going on and how things were put together. Overall was the story okay, it could have been much clearer and then I might have enjoyed it much more. This entry was posted in Book Review and tagged Adventure, Book Review, Dan Brown, Drama, Mystery, Thriller. Bookmark the permalink.